With a double bottom already in place at the $19 area, General Motors (NYSE: GM) stock broke above a key technical downtrend line, but barely. It now seems GM stock needs a boost to higher ground to make traders believe that double bottom won’t get tested again. After riding the wave of NAIAS 2012 to higher ground, General Motors Company (NYSE: GM) stock has once again started to show a lack of new buyers coming in. Perhaps the upmove since early January is merely taking a breather, awaiting more news like an earnings report. Still, just looking at the daily chart provided, you are once again reminded that stock price dynamics as told by price-time charts do not lie. Based on the philosophy of W.D. Gann, the legendary trader, the tape is the only truth you ever get from the market. Now that NAIAS 2012 is over, GM stock looks to be following the direction of the general market by moving lower; not to any great degree, but the trend upward has at least for now been stalled. Question is, why? Is there another reason than just taking a pause to catch its breath? Fact is, GM has no real new news coming out that might drive it upward, except that recent target target price of 31.70 per MarketWatch.com. A surpirse on the next earnings report would certainly help. In the meantime, the MA20 (20-day moving average) above the MA50 (50-day moving average) is a good supporting sign as is that double bottom price pattern. While the drive to get the marketing machine back in place for the Chevy Volt is in gear since its clean bill of health from NHTSA, though, fact is the Volt is not a major contributor to profits at this point in time; and may not be for many years at the rate it is going. This is not a negative on the technology at all. However, the electrification of the automobile is too expensive for the masses. So, automakers like GM are looking at hybrid versions in an attempt to get electrification and price tot eh point of affordability. Even Ford is bringing its EcoBoost in line with its electrification to create a Prius fighter. That is the only way to build up volume which can avail profits. GM needs to do the same with its Eco models for the Chevy Cruze and Malibu, but the Ecotec engine still needs to become more like EcoBoost in the manner of turbo boosting and promotion. At least GM has Buick’s eAssist™ and that could be expanded to Chevy, provided the cost isn’t too high. In my opinion, GM is behind Ford in this area of IC engine efficiency image; and the only way top leap ahead is to bring out that HCCI engine it has in its labs; better yet it needs to develop a version of the Scuderi or Tour split-cycle engines. More nat-gas options would help its image a lot, too. Imagine a nat-gas Cruze or a nat-gas Volt. Point is, instead of focusing on an Eco label for the window, GM needs to show not talk its way about green; and it needs to do it in a manner that is truly affordable for the masses. In the meantime, the taxpayer investment is still losing money at this point with stock this low; meaning, the government cannot get fully out of GM stock without first incurring that loss. The daily chart as I reported it mid-January was telling us the trend bias was bearish based on the 50-day moving average below the 150-day moving average. Well, that indicator pair has not changed; the 50-day moving average is still below the 150-day moving average. Likewise, that downtrend line has been breached to the upside, but the daily bars are tracking the line including the 150-day moving average as though it was a fence. Also for the record, that blue line representing the opening price of GM stock at 35.00 on its IPO debut just 14 months ago is still way ahead of GM’s present price of 24.37 based on Friday’s close. So, if 31.70 is a target, then traders may in fact be taking a breather on their way toward that end. Recall last time I wrote, though, until the charts tell us something new, all we have are support and resistance based on recent trading which is what really counts in the hearts and minds of many traders anyway. 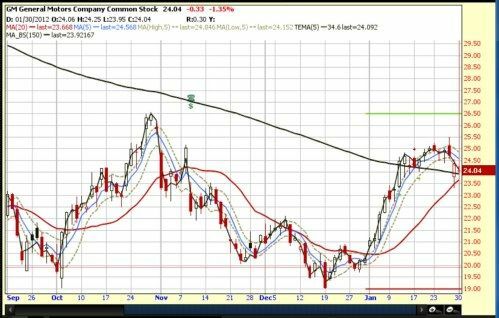 On the upward resistance, that swing high of 26.55 is still intact with an even lower swing high of 25.50. That means GM stock will have to penetrate those levels of resistance before it ever attempts to breack that target set by analysts. So far, though, the 19.05 level was tested creating a double bottom, which appears good for stock buyers, as it indicated two separate occasions where buyers came in. Clearly, 19.00 is strong support. Only a major bad news on the GM fundamentals or a general market downturn will likely retest that level; but it is still not out of the realm of possibilities. On the other hand, with the charts and levels of overhead price resistance, one would hope the stock can rise beyond the analyst target and at least make the IPO level so the government can get our money back with at least a breakeven. No-one can time share prices perfectly, but I managed to get in at 21. If the price tests this level again, i'll be getting more. WAIT TILL THEY START PAYING DIVIDENDS... AND THEY WILL. GM Europe is suffering, but so are all the rest of the producers there, but the great thing about this company is its diversification. Someone did something very RIGHT, despite all of the criticism. By the way, I have just discovered your newslatter, and it's great. I'll be looking out for you in the future! Brian, Many people would disagree with you on that. I agree that many would disagree. But not much is going on...other than simulations of course. Years and years of simulations. Meanwhile, Navistar has announced that they will have a truck ON THE ROAD, with an Ecomotors engine within months. VHS wasn't better than beta, but it took hold faster. Sometimes winning the race to market is the most important part of the process, and I think it will be here. Obviously, we all hear about NDA's, and big meetings. We get letters about how the relationships between the company and the oems will be progressing. We are told about signings and future ipo's. But nothing happens.